When her daughter, Amanda, was 4 and the state fair was only 3 miles away, Terry Ann Moore figured entering a recipe contest seemed like a good way to liven up the first slow week of August. For several years, Terry and “Mandi” enjoyed the fun, food and friends as well as the occasional ribbon or prize. Mandi, now in college, grew out of that phase years ago, but for Terry, it was just a start. Months after entering her first national contest, Terry got a call from a PR representative who said Terry had won First Prize — a trip to Cancun! Terry says she almost hung up on PR rep. “I’d forgotten I’d entered — or maybe I just never thought my recipe would win — and thought she was trying to sell me a time share!” Terry said. After that win, though, she was hooked on contesting. Most folks who know her, know that Terry specializes in baking, but she enjoys other areas of cooking as well. She won’t admit to which products they are, but she’s had a bit of success winning contests that involve cooking foods she doesn’t particularly care for herself. Fairs, festivals and other local contests have always been some of her favorite competitions, because she enjoys meeting others who enjoy cooking creatively. Over the years, she and husband Bob have found that making new friends is the best part of contesting. 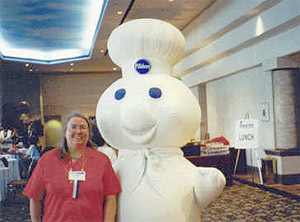 NOTABLE WINS: Finalist, Pillsbury Bake-Off in 1996, 1998 and 2000; Grand Prize Winner, 2001 National Oyster Cook-Off; Grand Prize Winner, 2001 Blue Bonnet “Bake It Better Contest (Cake Category); First-ever Club SAF “Baker of the Month”; First Place, 2000 Woman’s Day/NutraTaste “How Sweet It Is” Contest; Third Place, 2000 Better Homes and Gardens “Century Stand-Outs” Contest; First Place, Mushroom Festival Cook-Off in 1998, 1999 and 2000; Third Place, 2000 Merry-Chino Cherry Recipe Contest.